Simply Bags is pleased to offer our entire on-line selection of fashionable totes... travel, laptop, lunch, beach bags and so much more, available for embroidered logo customization. 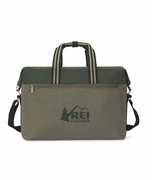 Proudly display your company logo on a stylish and functional tote. Select a logo, crest, or group insignia. 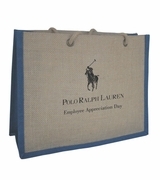 Custom bags are great for recognition, achievement awards or retirement gifts. 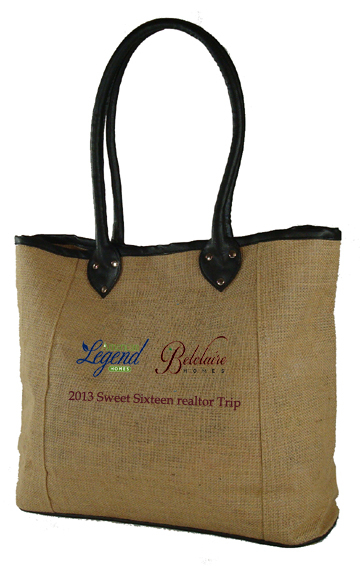 We can design a custom tote bag for your special occasion. This attractive custom boat bag was used for the Boston Red Sox spring training guests in 2014. The beautiful embroidered Red Sox logo accents this tote perfectly. 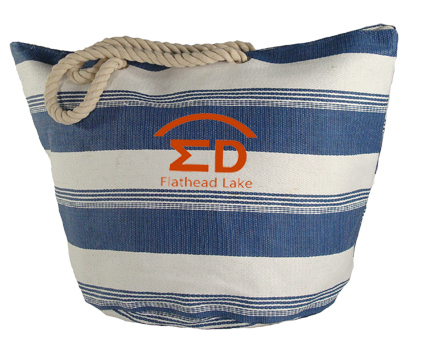 A cotton canvas boat tote with navy blue trimmed side pockets and heavy rope handles. 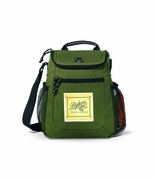 High quality construction with inside zippered pocket and snap closure. This unique custom tote bag was designed joining two companies together for a destination function. Let Simply Bags create a practical and exclusive conference tote for your next seminar, convention or recognition gift. 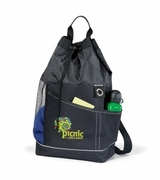 We also specialize in imprinted promotional bags to promote your business or sports team. This custom logo tote bag was embroidered for Lynn University in Boca Raton Florida for an the Presidential Debate in the fall of 2012. Featuring a red and white stripe canvas tote with a blue embroidered logo. The customer was delighted. Share this special day with your honored guests and have them always remember the great event with a embroidered wedding tote bag with your logo or bridal invitation header. Latest summer beach bag fashions for destination weddings. Shop our custom beach tote bag section for the bag of your choice. What a great idea... This sweet bride featured her family brand from their ranch in Montana for her wedding day logo bags. I am sure all her guests were impressed. Our striped 16 oz. canvas totes can be purchased in two sizes to fit your individual needs. Available in navy, hunter green, black and red with natural. Durable open totes with rope handles will make this a perfect usable tote for conventions, beach events or welcome bags. Our turnaround time from logo set up to shipping is usually within 5-7 business days. Let Simply Bags help make your event complete. 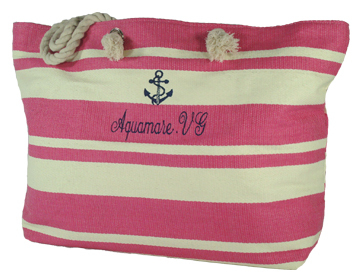 This nice quality striped jute beach tote was used for a destination renewing of vows in Aquamare, Virgin Gorda. A beach resort in the British Virgin Islands. A bag for each guest was filled with beach necessities as a thank you from the couple for their travel and attendance this special day. This light weight cotton canvas tote trimmed in royal blue was used for a school organization traveling from the USA to Australia. The two flags logo on the tote bag was filled with gifts for the host families and was sure to be well received. 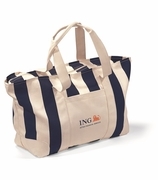 A perfect individual get-a-way or vacation travel tote. This striped cotton jute beach tote was used for a travel convention for the Dyax corporation. 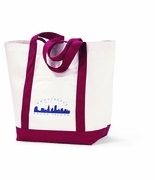 Just an accent logo at the top will make this beach tote usable during and after the event. Every beach tote in Simply Bags collection can be embroidered with a custom logo. Select the color and design that best suits your needs. 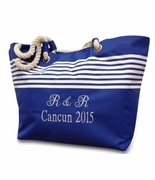 Simply Bags offers a large on going selection of beach totes for resort conventions, wedding destinations or family reunions and milestone events. 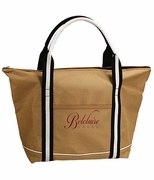 Any beach tote in our beach bag section may be customized with a logo, island name, family crest or monogram. No minimum order for custom beach bags! If you have a business conference, family gathering, or other group function on your calendar and would like to present your guests with a gift or goody bag, look no further than one of our custom embroidered tote bags to fulfill your requirement. Simply Bags offers a wide range of upscale totes, travel bags, computer bags, lunch and beach bags, and more. Our customizable bags will not only put a smile on the faces of your guests, but will also prove to be quite practical. Our fully-customizable beach bags are perfect for a family reunion or wedding, while our duffel, sport, or custom team bags would make the perfect gift for an annual corporate golf outing. 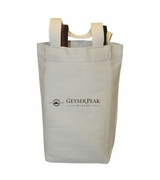 If you simply want to provide your conference guests with a practical souvenir that will help them tote their wares from point A to point B, our conference totes are the perfect solution, and can be customized with your unique company name or logo. Those who are planning a company awards, recognition, internal training session, you very well might find our selection of customizable lunch bags just the thing to keep their employees happy (and their stomachs full). Whatever your needs may be, we have a solution that is unique to you and your company.